This story picks up exactly where book one left off. 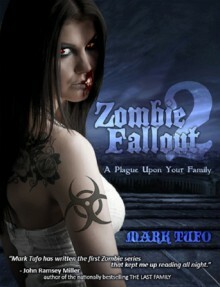 The Talbot family is evacuating their home amidst a zombie apocalypse. Mankind is on the edge of extinction as a new dominant, mindless opponent scours the landscape in search of food, which just so happens to be non-infected humans. In these pages, are the journal entries of Michael Talbot, his wife Tracy, their three kids Nicole, Justin and Travis. With them are Brendon, Nicole's fiance and Tommy previously a Wal-Mart door greeter who may be more than he seems. Together they struggle against a ruthless, relentless enemy that has singled them out above all others. The Talbots have escaped Little Turtle but to what end, on the run they find themselves encountering a far vaster evil than the one that has already beset them. As they travel across the war-torn country side they soon learn that there are more than just zombies to be fearful of, with law and order a long distant memory some humans have decided to take any and all matters into their own hands. Can the Talbots come through unscathed or will they suffer the fate of so many countless millions before them. It's not just brains versus brain-eaters anymore. And the stakes may be higher than merely life and death with eternal souls on the line.